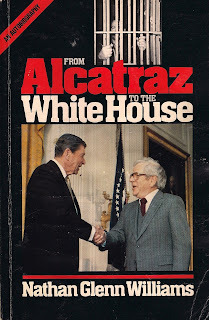 The 1991 autobiography of Nathan Glenn Williams carried the catchy title, From Alcatraz to the White House. A jury of his peers needed only five hours to reach a guilty verdict decision and the judge gave him “life in prison.” During the sentencing, the judge also informed the 23-year old Williams that he was the youngest person in the United States ever to be convicted of being an habitual criminal. Within months, Nathan Williams robbed a bank in Auburn, Washington, and got out with almost nine thousand dollars. He then took up a job driving trucks in Idaho, Nevada and Arizona and supplemented his income with “occasional” bank robberies in California and Oregon. A marriage and a daughter slowed the pace of Williams’ robberies, but a Friday afternoon heist of fifty-thousand dollars that got the attention of the FBI ended his career as a criminal. Williams was convicted on September 4, 1953 and sentenced to twenty-five years in the federal prison on McNeil Island. He was also fined ten thousand dollars. On April 7, 1954, inmate 1102 was transferred to the coziness of cell B256, on Alcatraz Island. But Williams said his life took a turn for the better when Protestant and Catholic ministers visited his cell. When he was denied the opportunity to take a correspondence course in law, Williams complained to his father, who said that he would speak with James V. Bennett (Director of the Federal Bureau of Prisons) in Washington. Williams’ fathers also promised that, if Bennett could not solve the problem, he would contact U.S. Supreme Court Justice William O’Douglas. Four months later, the correspondence course began. Williams was later transferred back to McNeil Island where he joined the company of Charles Manson and former Teamsters' President, Dave Beck. While undergoing medical treatment, Williams also had several discussions with Robert Stroud, the famed “Birdman” of Alcatraz. Williams earned his L.L.B., hung it on his cell wall and discovered what he thought to be a "flaw” in his case. The sentencing judge had “erred” because, among his three convictions, was the crime of use of a deadly weapon. But, the weapon Williams had used in the bank robbery had never been found. So, he contended he had only used a toy gun and asked U.S. District Court judge to set aside the conviction. Williams' sister also arranged for the assistance of Murray Gutterson, “the finest legal brain this side of the Mississippi.” On May 27, 1963, the deadly weapon judgment was vacated and Williams was put on probation for five years. Williams drove a dump truck, then an ambulance. He became involved with the Freemont Baptist Church and began to visit and counsel prisoners and ex-convicts. His schedule was packed with speaking engagements, television and radio shows. He then developed a program whereby indigent families could visit incarcerated loved ones and drove the bus. The program received considerable media attention. In August of 1978, Williams’ wife wrote to President Jimmy Carter and requested a presidential pardon for her husband. Williams also answered questions and filled out forms which “seemed endless.” But his application was supported by a Justice from the Washington Supreme Court, a member of a prisoner rehabilitation program and his minister. Williams' wife also rounded up a letter of support from a U.S. Senator from the state. But, the pardon arrived in the mail on Christmas Eve, 1980. Williams received even more publicity and, according to his autobiography, had more speaking engagements and television appearances than he could accommodate. On March 16, 1983, he received the Jefferson Award from the American Institute for Public Service in Washington, D.C. On May 7, 1984, he had breakfast at the White House with Ronald Reagan and received the President’s Volunteer Action Award. The Reagan’s invited Williams (a Democrat) to the Inaugural Ball in January of 1985. His trip from Alcatraz to the White House was complete.